A RUP LIFE: Pillsbury Baguette Chips Review & Giveaway #WIN! 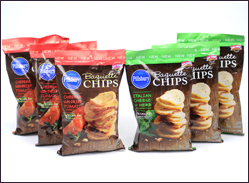 Pillsbury Baguette Chips Review & Giveaway #WIN! You can download a coupon for 75c off here. Would you like to try some? How about a giveaway?? ENTER TO WIN YOUR OWN PRIZE PACK! Tweet about this entry using #MYBLOGSPARK (can be done daily) ~ be sure to mention Pillsbury! Winner will be notified by email. Contest ends 7/31/2012 at 11:59 pm. Winner must email back with proper information with in 48 hours. Contest opened to USA residents only, random.org will be used in selecting winner. I'd love to try these b/c they look so good. I like pillsbury on fb. I would love to try them they look soo yummy! I would love to win this so I can try them - they look so good! !